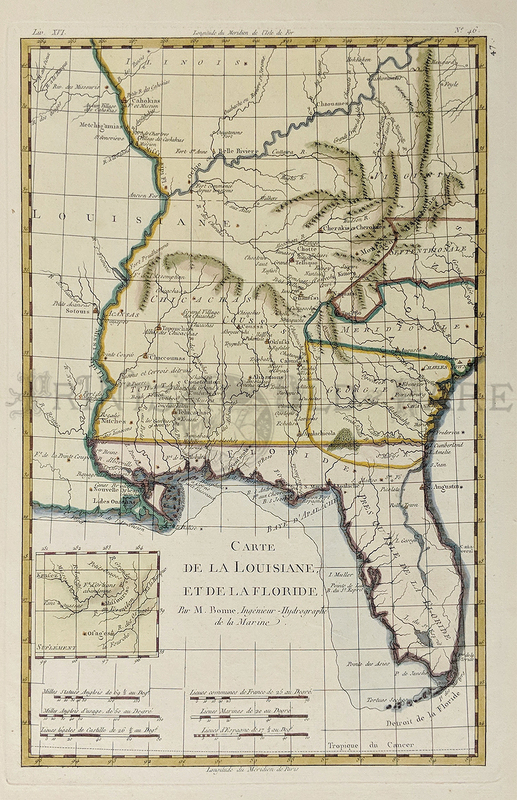 Antique Georgia Prints and Maps. 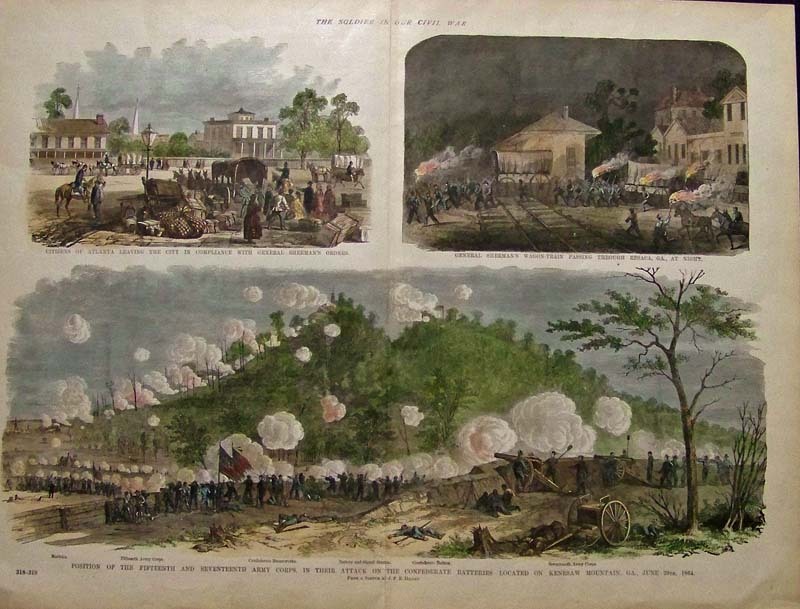 1866 Savannah Civil War. 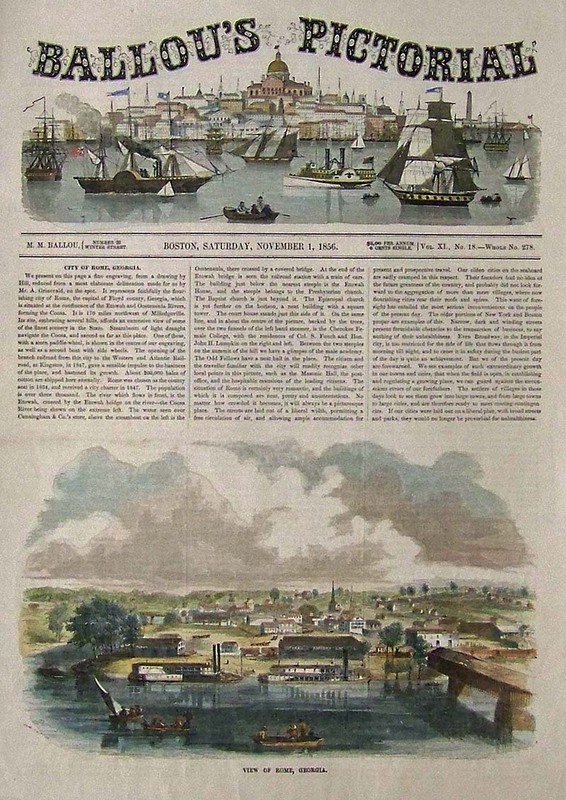 Two rare views on one page. 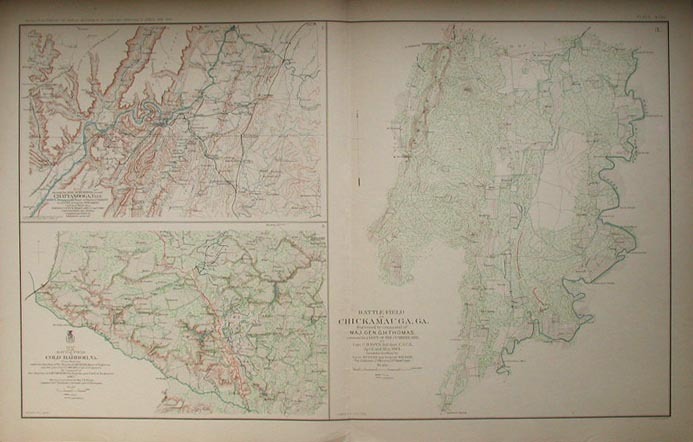 Civil War Atlas map. 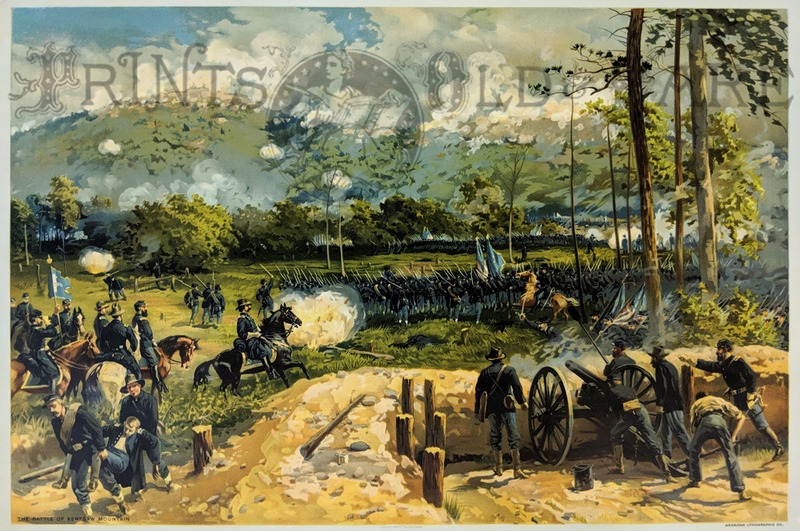 Three parts, showing, Army Movements around Chattanooga, Tenn.; The Battle-Field of Cold Harbor, Va.; and Battle-Field of Chickamauga, Ga. 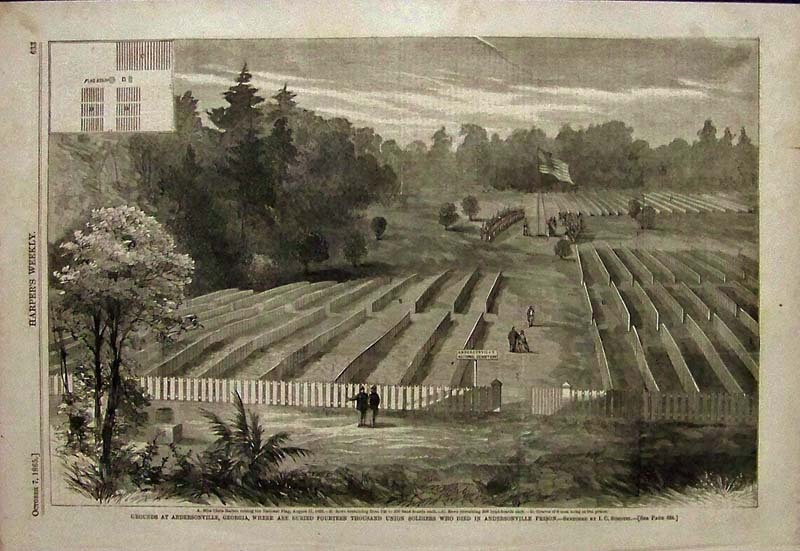 Printed by the U.S. Government following the war. 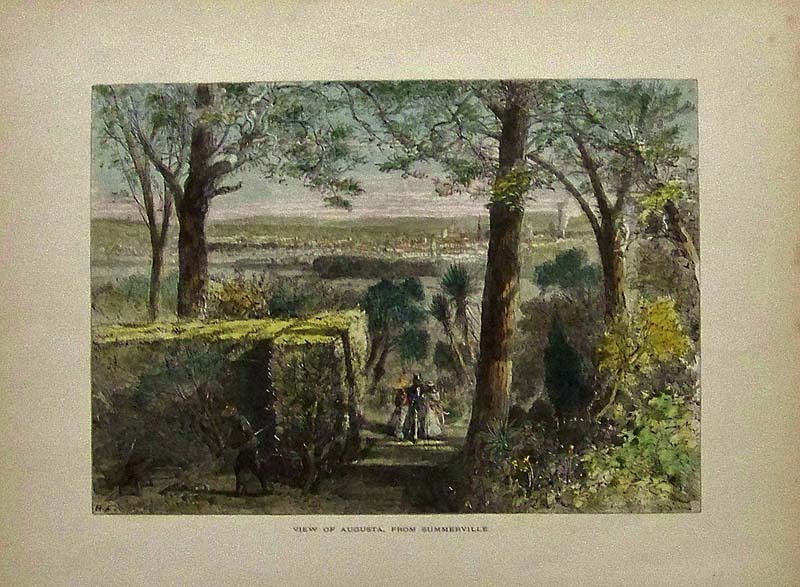 1873 Hand colored wood engraved view of Augusta, From Summerville. Featured in Picturesque America. 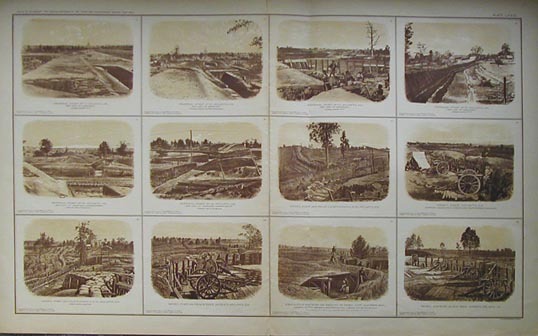 1864 Civil War views of Ringold, Georgia. 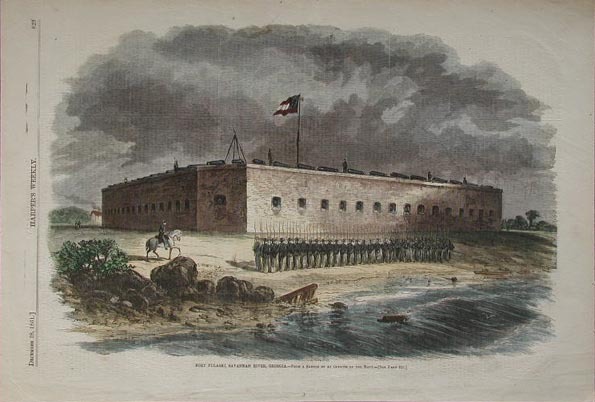 Hand colored engraving from Harper's Pictorial History of the Civil War. Civil War Atlanta. 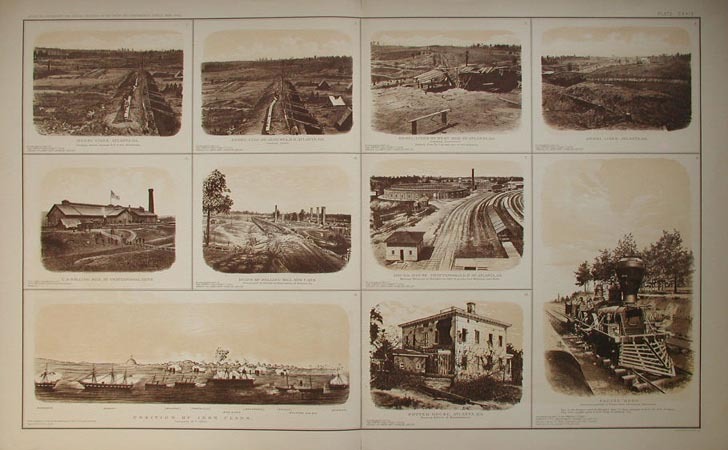 Twelve sepia views on one large page. 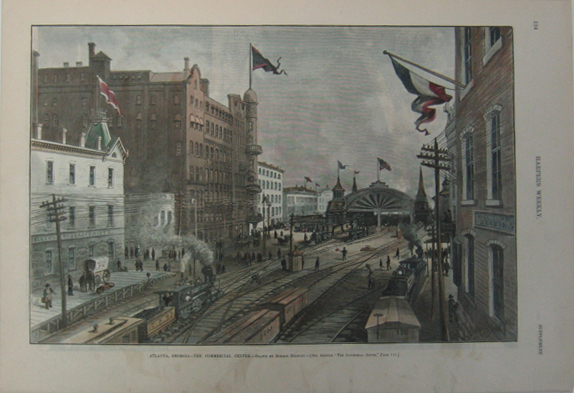 Printed by U.S. Government after the War. 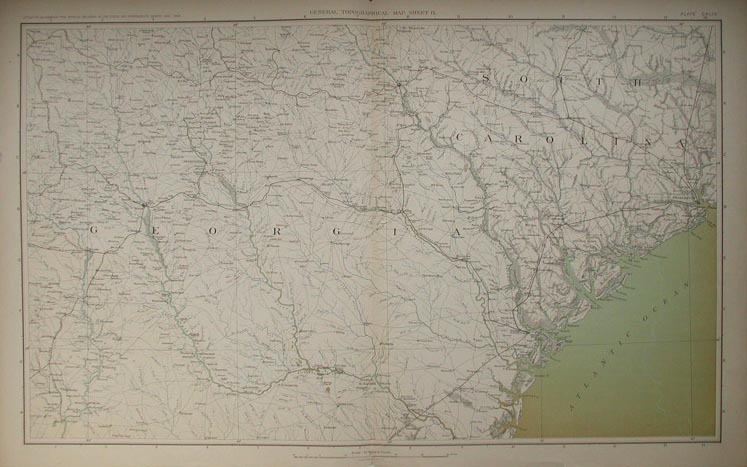 Civil War Map: Georgia, South Carolina. 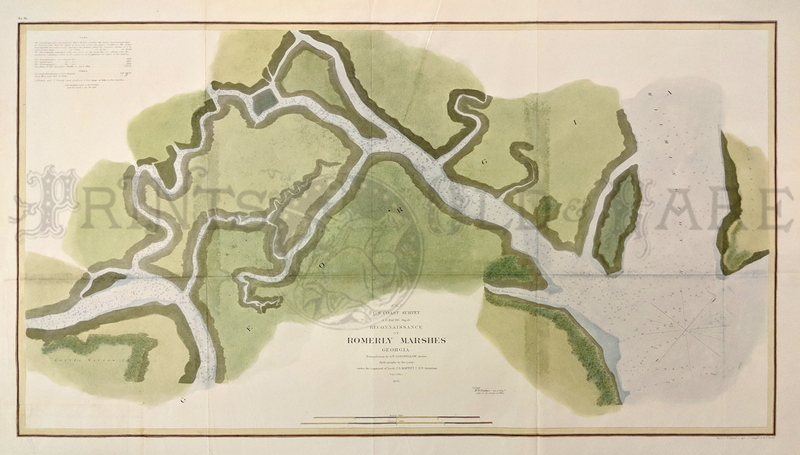 This is a map from the Atlas to Accompany the Official Records of the Union and Confederate Armies, published by the United States government in 1895. 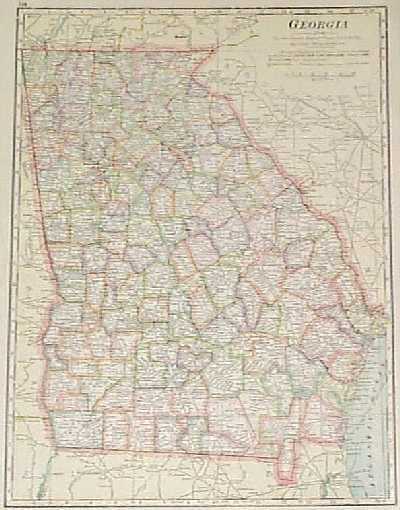 It covers an area from central Georgia to central South Carolina, with Atlanta on the far left and Augusta in the middle. 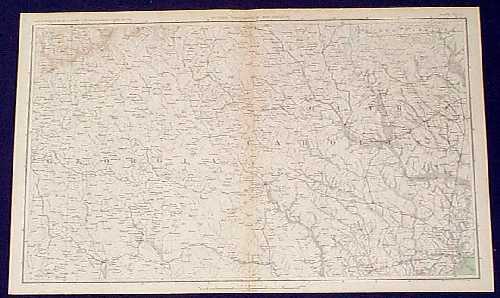 The map is extremely detailed, showing roads, railroad lines and even the smallest villages. Geographical features are shown in detail as well. 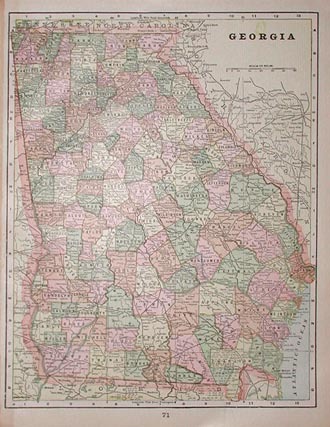 1895 Map of Georgia. 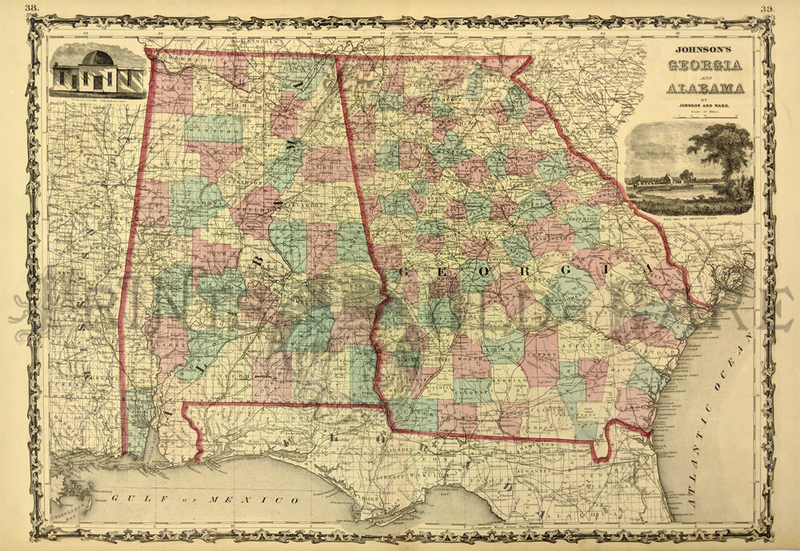 Colorful map of the state, from the 1895 Rand McNally Atlas of the World. 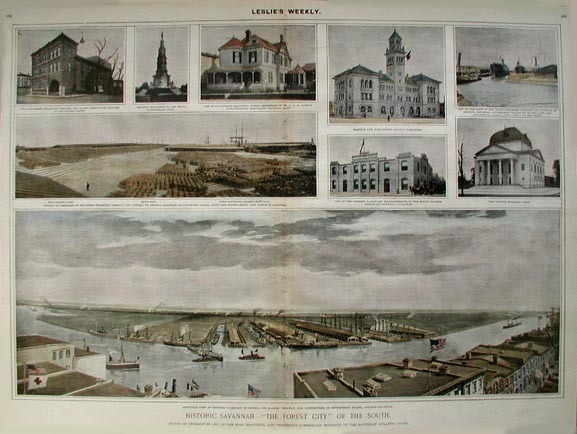 Cities, towns, railroad lines and geographical features are all shown. In the left and right margins, there are keys showing the locations of counties, cities and towns. 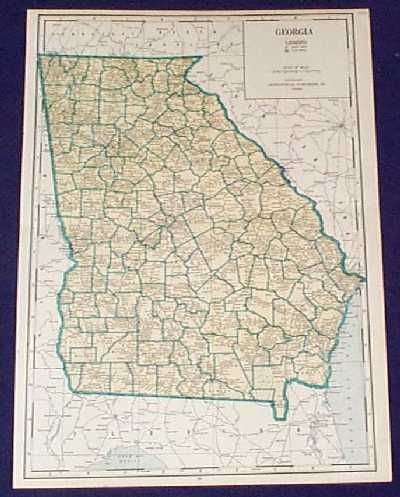 1934 Map of Georgia. 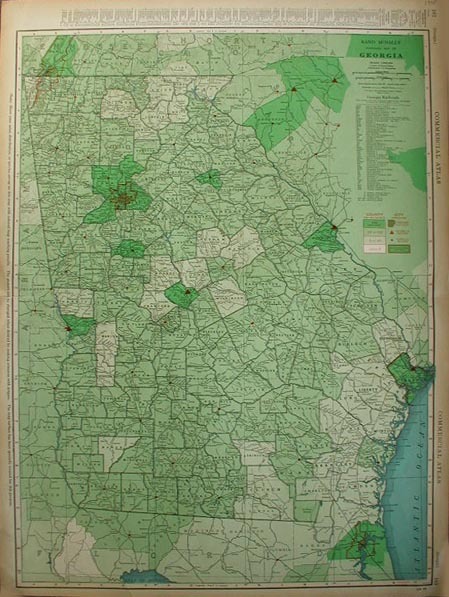 Interesting map, printed in 1934 by the Geographical Publishing Co. Each county is outlined in green. Cities, towns, railroad lines, rivers and swamp land are all marked. 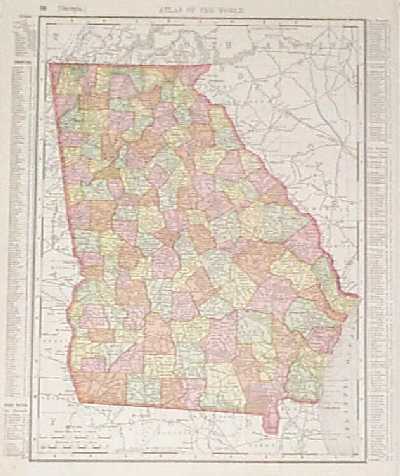 Decorative county map of the States of Georgia and Alabama. 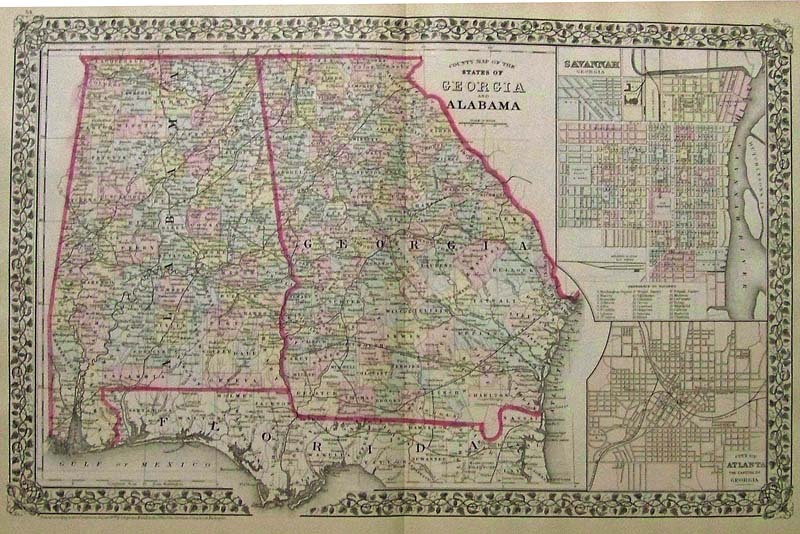 Published in 1881 by Mitchell, two insets on the right side show the cities of Savannah (upper) and Atlanta (lower). Cities, towns, rivers, mountains and major roads are shown throughout the region. 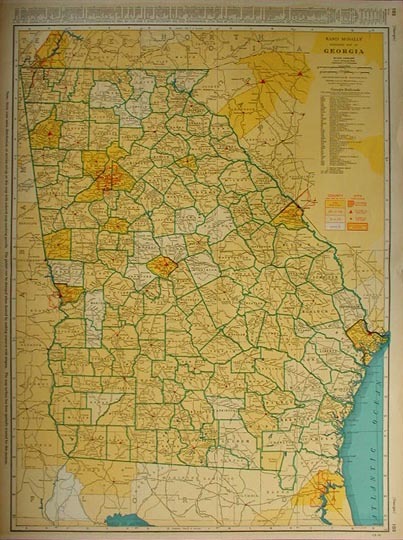 Each county is individually hand colored. 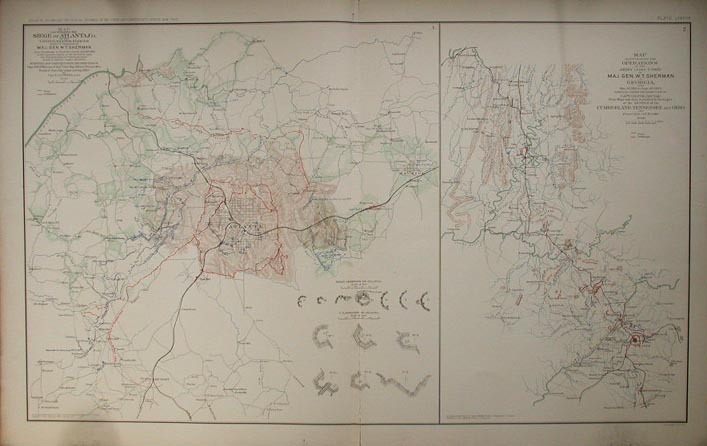 The map is in excellent condition. 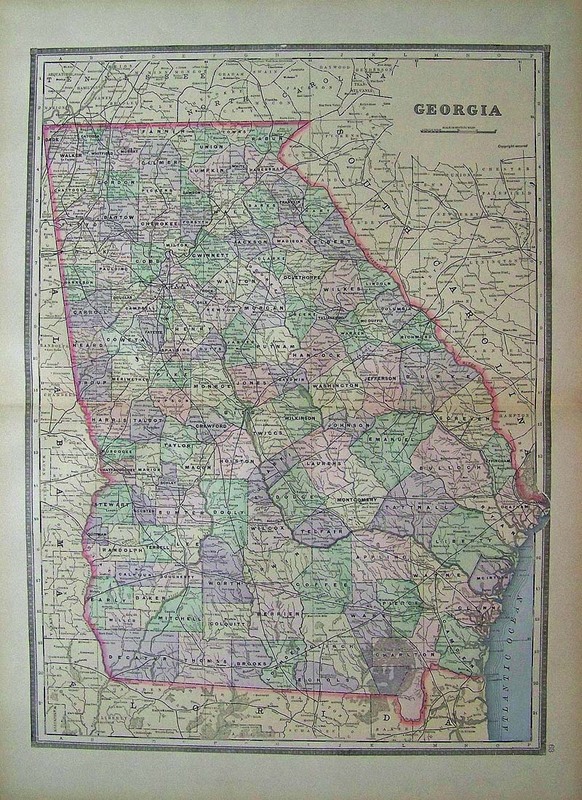 1891 Bradley color lithographed map of Georgia, showing in detail all the cities and thoroughfares. would look great in a frame. 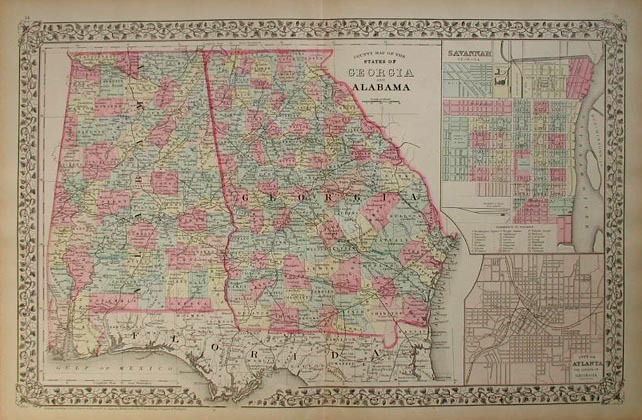 1861 Johnson's Georgia and Alabama Map. Showing the counties, cities, towns and roads. 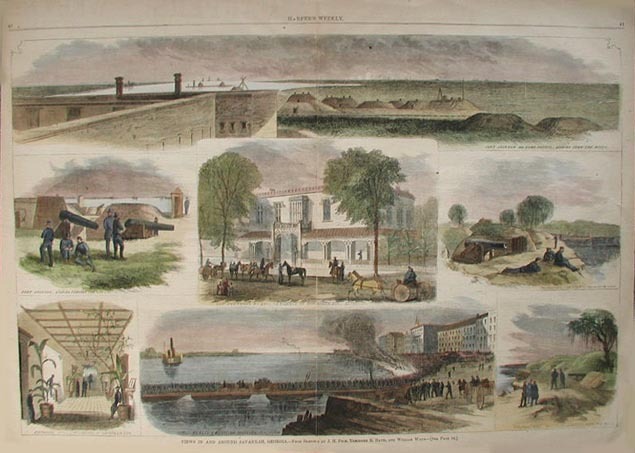 2 vignettes of Tuscaloosa Observatory and Rice-Mill on Savannah River upper left and right side. 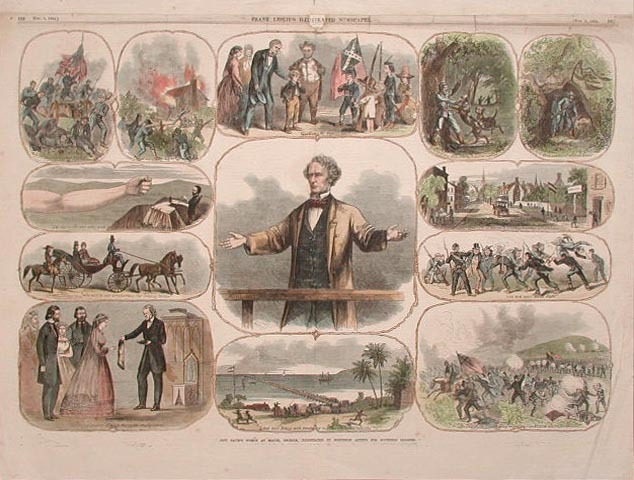 1861 Winslow Homer wood engraving titled, "The Georgia Delegation in Congress." This was at the start of the Civil War. 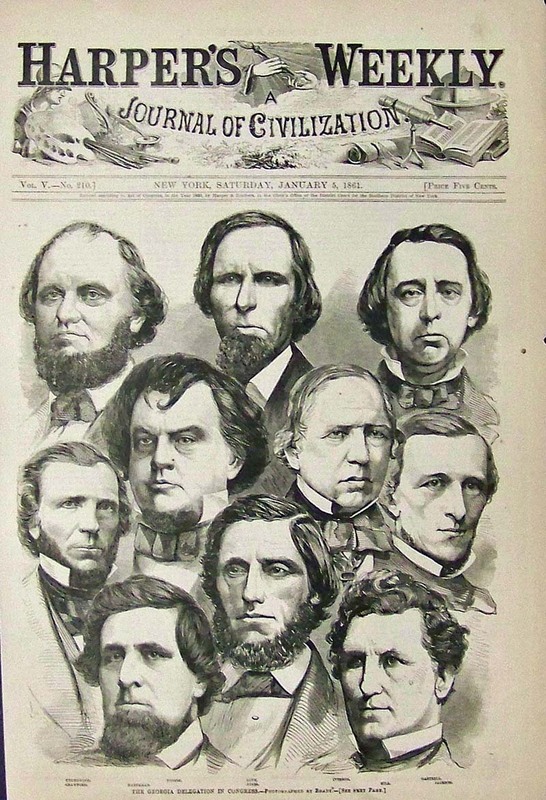 Solidiers of the Civil War. 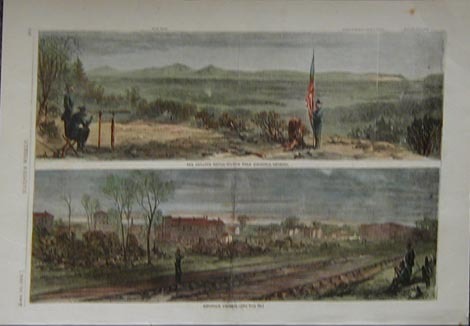 1864 Harper's Weekly hand colored wood engraving showing five scenes related to General Sherman's Campaign. 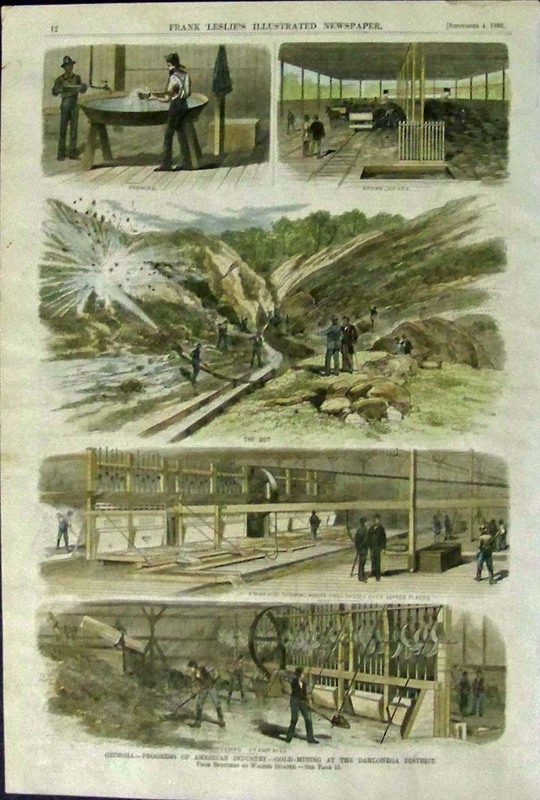 Sketches by Theodore R. Davis. Top acene shows the Railroad Depot at Resaca, Georgia. 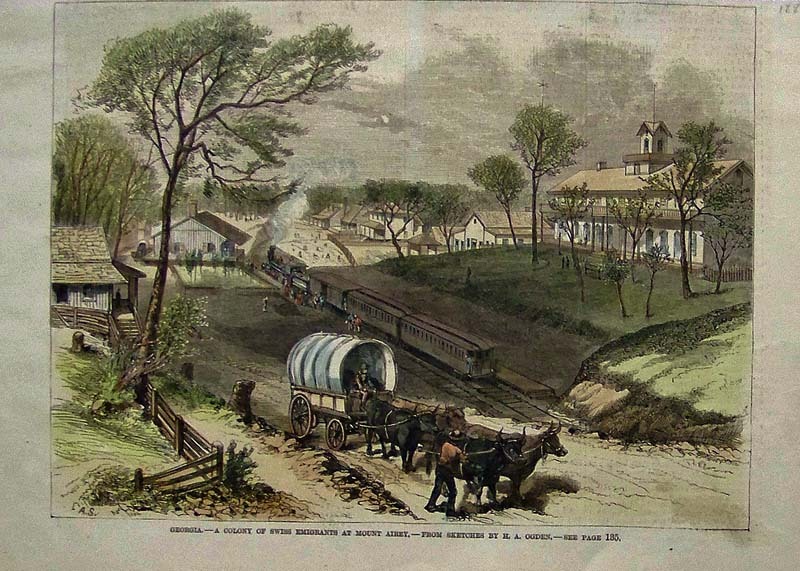 Second image shows Adairsville, Georgia. Third image from top shows Kingston, Georgia. 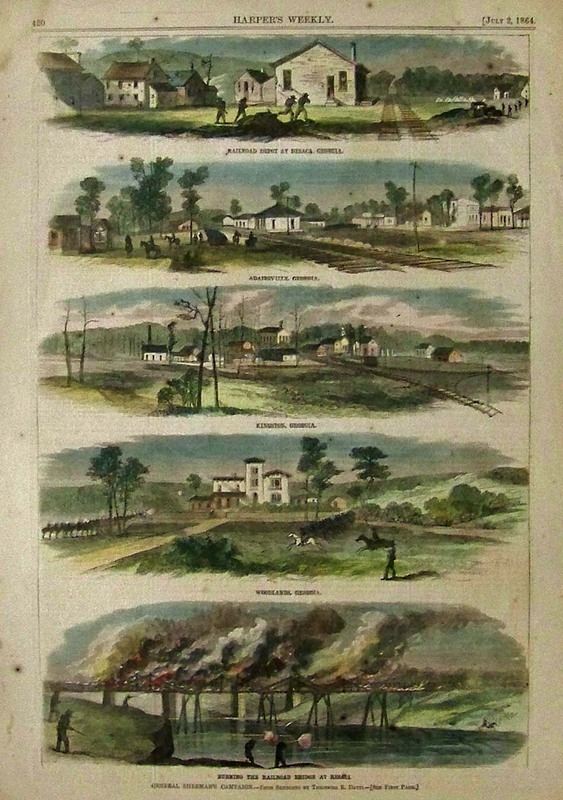 Fouth image shows Woodlands, Georgia; and bottom image shows Burning the Railroad Bridge at Resaca. 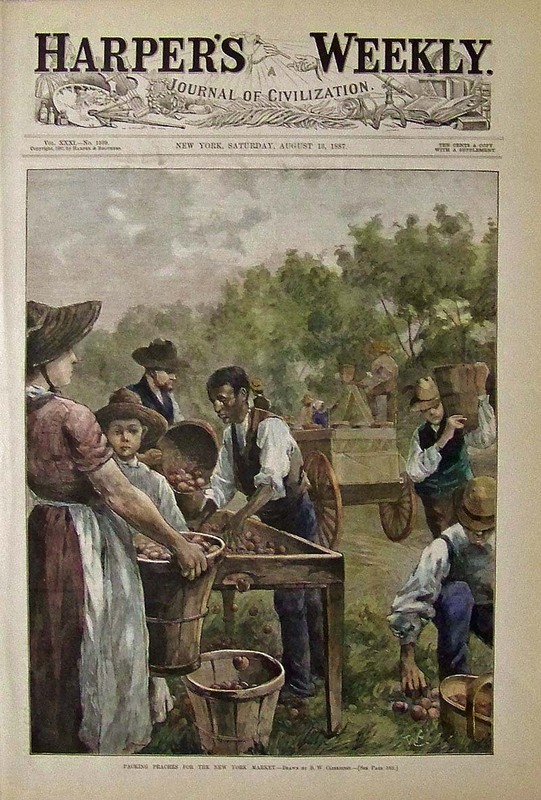 1887 Hand colored wood engraving showing people packing peaches for the New York Market. Drawn by B.W. Clinedinst. 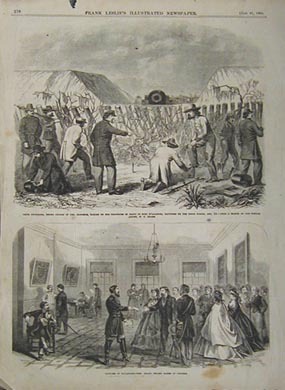 1864 Harper's Weekly wood engravings showing two scenes from the Campaign in Georgia. 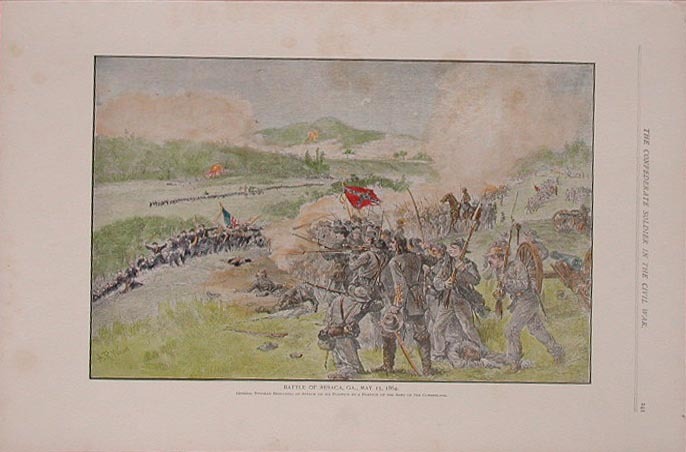 Top image shows Robinson's Brigade, of Hookers Corps, saving the Fifth Indiana Battery on May 14, 1864. 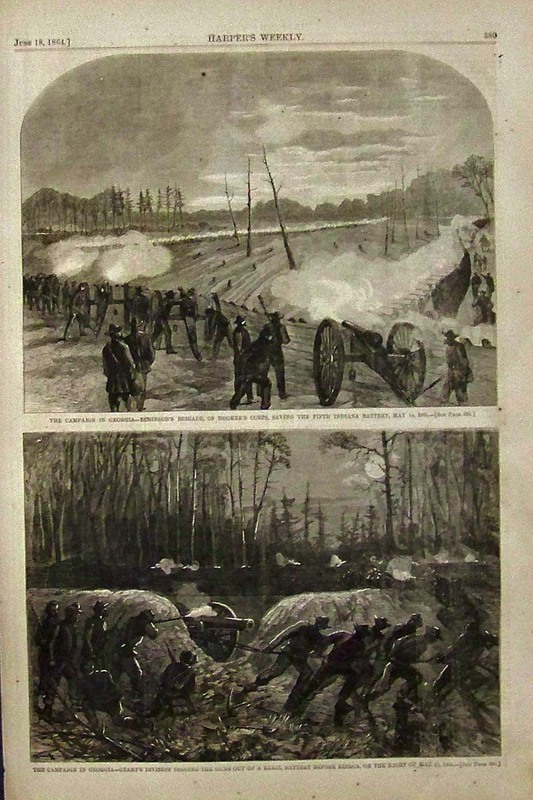 Bottom image shows Geary's Division digging the guns out of a Rebel Battery before Resaca, on the Night of May, 15, 1864. 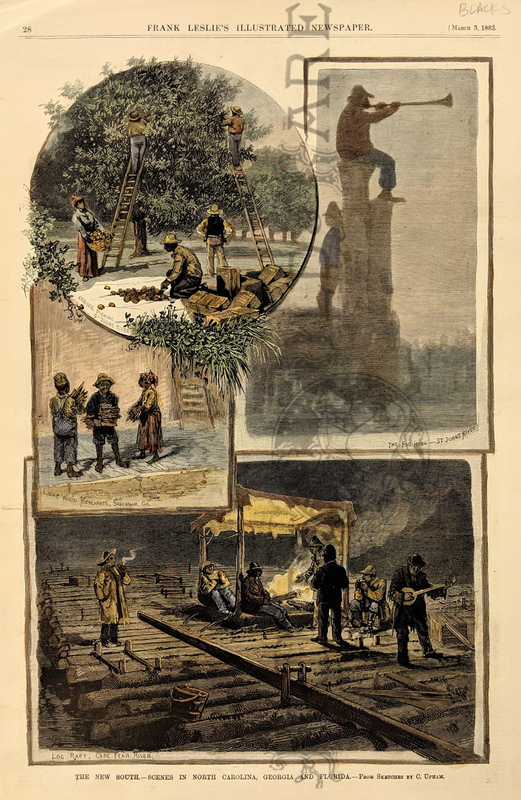 1880 hand colored wood engraving titled, "Georgia, -- A Colony of Swiss Emigrants at Mount Airey." 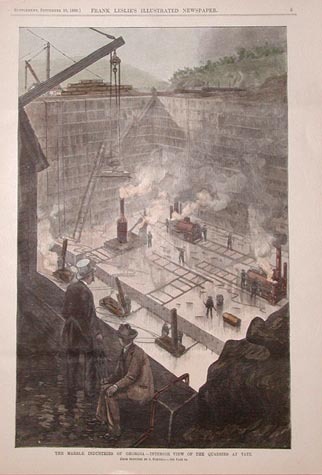 From Sketches by H.A. Ogden. 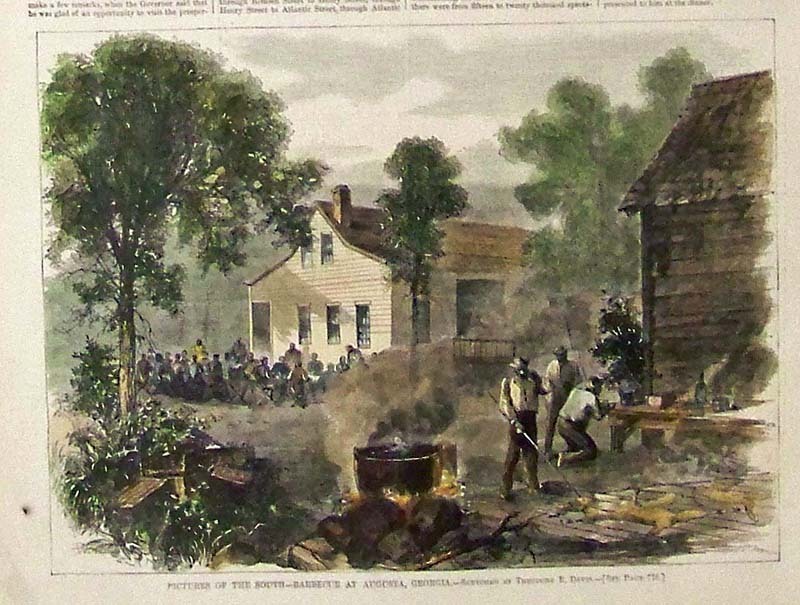 1866 Harper's Weekly half-page hand colored wood engraving showing an image titled, "Pictures of the South -- Barbecue at Agusta, Georgia." 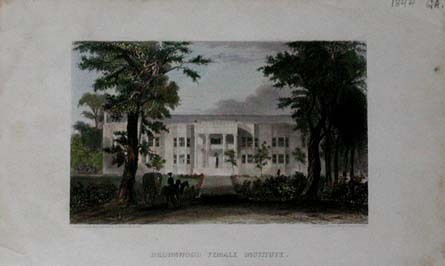 Sketched by Theodore R. Davis.